Prove you have exquisite taste for design and decor when you purchase this beautiful, full leaded 30 Oz Exception Crystal Liquor Decanter. This is a fine, mouth blown, 24% full lead crystal liquor decanter that holds any type of liquor like bourbon, scotch or non-liquor like wine. This crystal decanter is ideal for your home, as a house warming present and it is a great bride and groom gift. 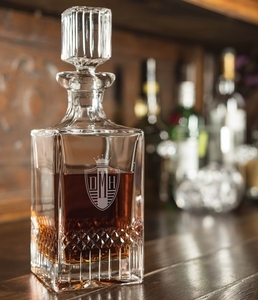 The crystal liquor decanter goes beautifully with upscale bar ware. This full leaded crystal liquor decanter has brilliant craftsmanship and a restrained hand-cut pattern for true elegance.The crystal liquor decanter lets you enjoy liquor the way it was meant to be enjoyed, poured from a brilliant piece of glassware. Exclusive 24% full leaded crystal liquor decanter. Hand blown leaded crystal. May contain imperfections. due to the process of making hand-blown crystal. The crystal decanter and other glass and bar ware in this set often contains small bubbles, swirls and other imperfections.